USDA’s School Breakfast Program boosts the diet of nearly 15 million children in more than 97,000 schools. Wholesome meals at school support educational achievement – and bright opportunities ahead for our nation’s kids and teens. Which is why, each year, during National School Breakfast Week (March 5-9), USDA recognizes the importance of a healthy start and the many ways the School Breakfast Program improves the health and nutrition of school children nationwide. USDA’s Food and Nutrition Service will join partners and stakeholders across the country in celebrating National School Breakfast Week, along with National Nutrition Month, which spans the month of March. Protecting the health and wellbeing of our children is a responsibility we all share. It’s a job made more doable and effective thanks to the common-sense flexibilities USDA extended to schools to help them comply with milk, sodium and whole grain requirements. And school meals have a vital role to play, particularly breakfast, which gives kids a healthy start to their day. School breakfast also promotes self-reliance among schoolchildren, providing food they need to thrive, learn, and get ready to succeed and achieve their dreams. A pathway to success, however, is just one of the many benefits to a healthy start. Research shows that students who eat breakfast make greater strides on standardized tests, pay attention and behave better in class, and are less frequently tardy, absent or visiting the nurse’s office. School breakfast is also an important tool in the fight against childhood hunger. Since many children who participate are from lower income families, the program serves as a nutritional foundation critical to their success. 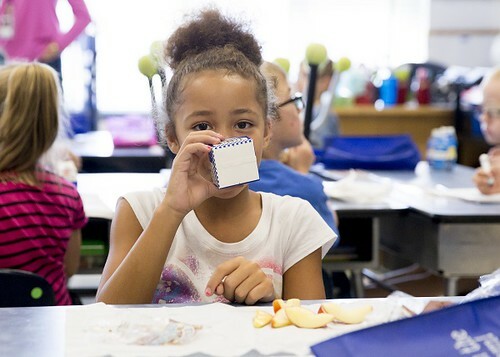 For more than half a century, the School Breakfast Program has nourished students of all economic backgrounds with a well-balanced, healthy meal consistent with the latest nutrition science and Dietary Guidelines for Americans. The program helps give kids the kick-start they need to be healthy and strong all day. Ensuring the viability, efficiency and integrity of the breakfast and lunch programs is critical. USDA is committed to leveraging technology and innovation to ensure our nation’s children have access to wholesome, nutritious and tasty school meals. Just over a year ago, the department released a model online tool to help school districts and their software vendors design their own user-friendly, integrity-focused online school meal applications for free and reduced-price meals. The interactive application incorporates feedback from stakeholders to make it easy for families to use and streamline processing for schools. A central design feature of this model application is an “interview,” similar to what’s used in commercial tax software, to guide applicants through accurately reporting their income. This helps minimize mistakes and maximize integrity so children from low-income households can get the food they need. To build on that effort, USDA released a guidance memo to encourage state agencies and school districts to take the next step in adopting a web-based application. Because we used public or “open source” program code, we are able to distribute the model application for free, which helps reduce development costs for schools and encourages industry innovation. USDA has also published a collection of toolkit resources to support local school officials with the process of verifying the accuracy of school meal applications. Verification is a process conducted annually by schools to confirm the eligibility status of households approved to receive free or reduced-price school meals. The toolkit helps promote integrity by equipping schools with effective strategies and best practices to ensure meals are provided to those eligible. USDA is taking steps to support program operations in small districts (less than 2,500 students). We’re proposing new hiring flexibilities to expand the pool of professionals who are eligible to lead our school meal programs. Secretary Sonny Perdue is a strong proponent of empowering local communities with all the flexibilities we can to operate the programs in ways that best serve their children, and this proposal reflects the fact that the expertise needed to serve great school meals can come not only from training and education, but also from real-world experience. These are some of the many ways USDA – through technology, creative problem-solving and information sharing – is working to improve program integrity, reduce administrative burden and most importantly, serve children well. We are committed to ensuring every child in America – regardless of their family’s income – gets nutritious school meals to succeed in the classroom and beyond. After all, a brighter future is what all our customers, especially our youngest, deserve.